Med den här ljud switchen kan man distribuera 4 Digitala Koax och 4 Digitala Optiska ( toslink ) källor till 10 Digitala Koax och 10 Digitala Optiska utgångar. ?The AU-D820 allows the user to switch and distribute 4 Digital Coaxial inputs and 4 Digital Optical audio inputs to 10 Digital Coaxial and 10 Digital Optical outputs. 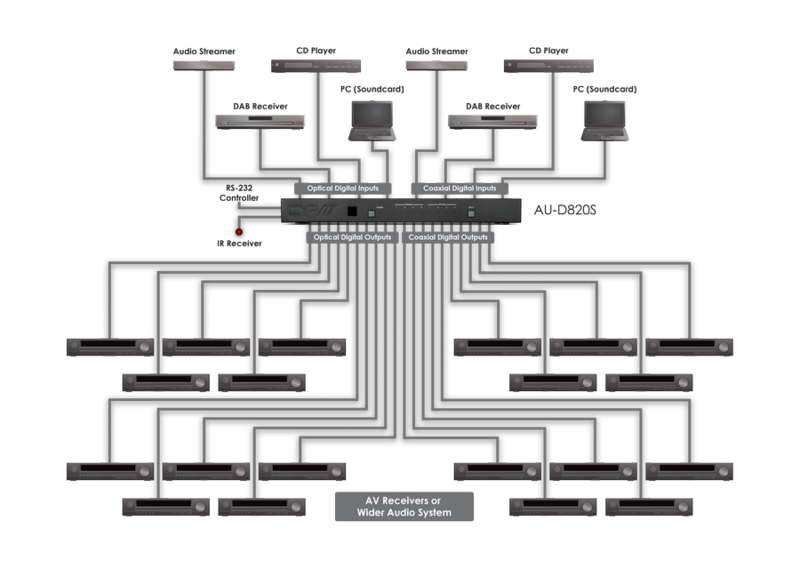 Select any audio input for distribution of the audio signal to all outputs simultaneously. Incoming audio signals are converted to allow all optical and coaxial outputs to operate simultaneously.